Wim Klooster, Revolutions in the Atlantic World: A Comparative History: New Edition (New York: New York University Press, 2018). A few years ago, I found myself speaking briefly to a graduate student in another discipline who happened to share both my first and last names. He politely asked what I studied, and I vaguely explained that my dissertation related to the Age of Revolutions. Other Jordan considered this for a moment, and then asked “So what causes revolutions?” I’m embarrassed to say that this most straightforward of questions left me a bit flat footed. I could tell him what several historians thought about the particular revolutions they studied, but “revolutions” more generally? That was a big question. I think I muttered something about Arendt (as you do) and excused myself. Perhaps because I was inevitably comparing myself to Bizarro Jordan, I started to think about comparative historical work. 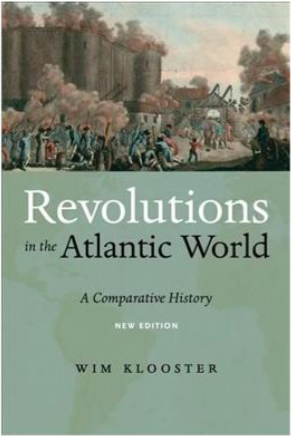 Historians don’t do enough comparative research—and from reading the new edition of Wim Klooster’s impressive volume Revolutions in the Atlantic World: A Comparative History, it’s easy to see why. It is difficult enough to master the narrative and historiography of one revolution—let alone the many bodies of scholarship that Klooster sinks his teeth into here. Klooster’s book skillfully describes the late eighteenth- and early nineteenth-century revolutions in British North America, France, Saint-Domingue, and Spanish America, each in only a chapter. These chapters manage to be admirably concise without sacrificing too much complexity. At the pace he sets, it must have been tempting to tell a largely political story, but Klooster lingers in social and cultural changes, the roles of women and people of color in revolutions, and the surprising details that cut against traditional narratives. He does not tell a simple story guided by a single overarching principle, but a series of thick narratives that add up to something even more complex. The book’s first and sixth chapters, which compare these events, offer Klooster’s most important interventions—and go a long way to answering Mirror Jordan’s question. Klooster provides four common features of these revolutions: they took place in an international context, they were contingent, they were civil wars, and they were not aimed at the creation of democratic societies. Of these four major features, Klooster unpacks the second, regarding contingency, most thoroughly. If revolutions were not foreordained, several conditions made them more likely. The Enlightenment provides a common point of departure for his four revolutionary stories. In Klooster’s account, ideas emerging from Enlightenment arguments helped to inspire a transition from privileges to rights as means of organizing social power. Surprisingly, and perhaps controversially, Klooster also applies the term “privileges” to describe the system of racial and ethnic hierarchies in the Americas (see p. 6). In an early endnote, Klooster notes that his is the first volume to examine these four revolutionary events together. Indeed, the most significant syntheses of the Age of Revolutions have had different aspirations. Robert Palmer famously focused heavily on America and France, but offered only a paragraph for the Haitian Revolution. Lester Langley examined the western hemisphere. Leora Auslander focused on France, America, and Britain. David Armitage and Sanja Subrahmanyam’s edited volume looked at these revolutions, and much more besides, but their aim was not primarily comparative. Janet Polasky’s recent volume ends before the onset of the Spanish American revolutions. This is a remarkable lacuna. For tackling it alone, Klooster deserves recognition and careful engagement. But because Klooster is more interested in the major revolutionary events of the late eighteenth and early nineteenth centuries, he misses out on the many minor revolutionary events that fizzled out and were quickly forgotten in places such as Ireland, Poland, Guadeloupe, Martinique, Hungary, Geneva, the Netherlands, and Belgium. This is more an observation than a criticism—Klooster should not be faulted for a lack of ambition. Yet future historians may build on Klooster’s analysis (as well as on the works of Polasky and Palmer which are interested in these proto-revolutions) to produce further syntheses that are attentive to revolutions big and small, familiar and obscure. Investigating the almost- and not quite-revolutions may help us to better understand, as Klooster sets out to do, why revolutions erupt in some places, and fizzle in others. Klooster has done the field an important service in creating a synthesis that will be useful to both teachers and students. Anyone teaching the Age of Revolutions would benefit from having this text on hand. Klooster’s efforts should contribute to a new wave of synthesis in the comparative study of the Age of Revolutions. Jeremy Adelman, Sovereignty and Revolution in the Iberian Atlantic(Princeton: Princeton University Press, 2009), 3. See R.R. Palmer, The Age of the Democratic Revolution: A Political History of Europe and America, 1760-1800(Princeton: Princeton University Press, 1959–64); Lester D. Langley, The Americas in the Age of Revolution, 1750–1850 (New Haven: Yale University Press, 1996); Leora Auslander, Cultural Revolutions: The Politics of Everyday Life in Britain, North America, and France(New York: Berg, 2009); David Armitage and Sanjay Subrahmanyam, eds., The Age of Revolutions in Global Context, c. 1760–1840(Basingstoke: Palgrave Macmillan, 2010); Janet Polasky, Revolutions without Borders: The Call to Liberty in the Atlantic World(Cambridge: Harvard University Press, 2015).